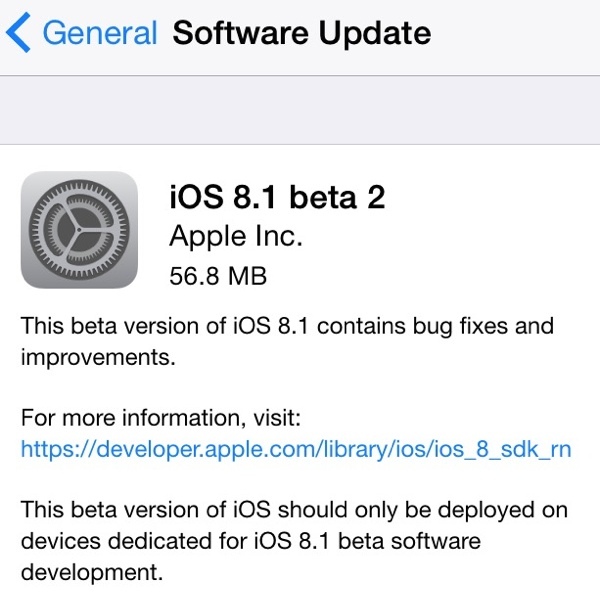 Apple today released the second beta of iOS 8.1, build 12B407, to registered developers for testing purposes, just over a week after the release of the first iOS 8.1 beta. Apple has also released Apple TV Software beta 2 and Xcode 6.1 golden master seed 2.
iOS 8.1 includes several bug fixes for issues in iOS 8, including a fix for a Bluetooth connectivity problem, and it also includes support for Apple Pay, Apple's mobile payments service that is launching in October. Along with iOS 8.1, Apple is also simultaneously working on iOS 8.2 and iOS 8.3, all of which are expected to add new functionality to the operating system. iOS 8 has had a rough start, with Apple temporarily removing HealthKit ahead of the launch of iOS 8 and then releasing an unstable iOS 8.0.1 update that disabled the cellular and Touch ID service of many users. Apple released iOS 8.0.2 to fix the issue, but several other problems have come to light, including a bug that causes iCloud Drive documents to be deleted. Hope this lists about 14 pages of bug fixes, starting with the CORE apple stuff. Yes. iOS 8.1 Beta's make use of the Barometer to calculate the pressure applied during bending, then it uses the same force within the housing to bend back using the gyroscope by spinning in anti clockwise using thread which is connected to fragile parts of the aluminum case. Sadly you need to factory reset before you start the bending process. Hoping 8.1 fixes copy/paste and Safari keyboard freezing and crashing the app. Its barely usable on any of my three iPads (air, mini gen 1 and ipad 2).